This page is focused upon providing Washington, DC residents with a brief review of neurofeedback services in the DC area. Please note that neurofeedback in DC must be provided by a licensed medical professional, and Washington, DC neurofeedback services have not been approved to diagnose or treat disease. There are many high quality neurofeedback providers in the Washington, DC area, so we strongly advise that you conduct your own independent research and learn more about the variety of professionals who offer this service in the DC area. Note: Neurofeedback in Washington, DC or other areas is not FDA approved for the diagnosis or treatment of disease. Any statements that follow are for speculative purposes alone. Speak with a Medical Doctor if you have any of the below conditions, and do not rely upon neurofeedback for anything other than a Wellness Tool as a component of a Healthy Lifestyle. Neurofeedback in Washington, DC recognizes that nerve cells (neurons) must constantly transmit electrochemical signals in order to sustain life, and the transmission of these signals results in a small, measurable electromagnetic field, which is produced as nerve cells communicate with each other (Libenson, 2010). These tiny electromagnetic fields may be measured through electroencephalography (EEG), which is integrated into Washington, DC Neurofeedback systems. The application of EEG/Neurofeedback observations in DC results in the measured frequency of nerve cell discharge in the brain, also known as “brainwave” activity, which ranges from delta to theta, alpha, beta, and gamma. Through applying the use of EEG and computer generated feedback, one may develop an understanding of the ways in which related brain regions may be voluntarily activated and deactivated in order to produce a variety of beneficial effects. According to Paul Swingle, the brainwave states of humans range from delta to theta, alpha, Sensory Motor Rhythm (SMR), beta, and gamma - DC neurofeedback measures these patterns (Swingle, 2008). Each brainwave state has an associated state of mind, which can be healthy and balanced as well as a state that is unhealthy and indicative of pathology. An excess or deficiency of any brainwave state is possible, and the result of either condition is proposed to point to specific neurological conditions. Depression, traumatic brain injury, ADD, autism, anxiety, and many other disorders have been linked with specific brainwave states. Therefore, the treatment of these conditions is possible through the use of technologies in Washington, DC, which correct imbalances in brainwave patterns when utilized as a component of a healthy lifestyle (Disclaimer: Neurofeedback in DC is not intended to diagnose or treat disease). Neurofeedback in DC measures brainwave activity. Delta is the lowest detectable frequency in the human brain, oscillating between approximately 0.5 and 2 Hz. Delta waves are considered healthy when they are dominant as drowsiness sets in as well as in the deeper stages of sleep. However, if an individual is producing an excess of delta waves while they are awake and alert, this could be a sign of pathology. An excess of delta in the frontal region of the brain during a waking state could result in the experience of mental fog or fatigue. An excess of delta in the frontal area can also result in chronic pain such as fibromyalgia. 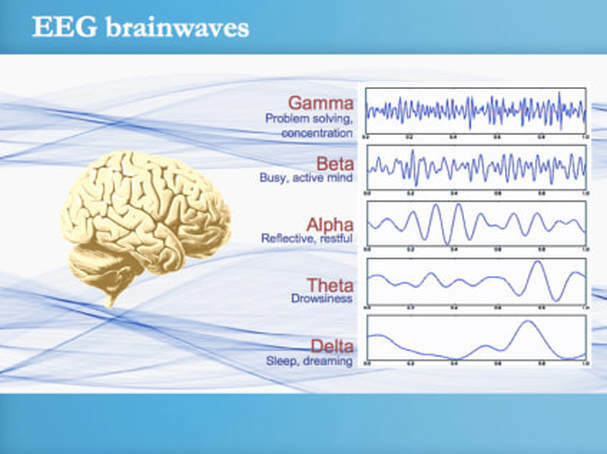 Theta waves are the next lowest frequency of detectable brainwaves through Washington, DC neurofeedback services. Theta brainwaves oscillate between 3 and 7 Hz and are the second lowest detectable frequency in the human brain. Advanced meditators are often skilled at producing high amplitude theta at will, a state which is associated with hypnotic trance, introspection, contemplation, quietness of mind, and metacognition - DC Neurofeedback may enhance access to these states. Theta plays a very important role in quieting the nervous system and relaxing attention. Deficiencies in theta waves at the occipital region of the brain are associated with anxiety, “sleep disturbance, low stress tolerance, and a predisposition to addiction” (Swingle, 2008 p. 45). Likewise, injured brain tissue is often unable to produce any amplitude higher than theta, compromising its capacity to communicate with surrounding tissue, which can also result in the aforementioned symptoms. Alpha brainwave patterns fall in a higher band of frequency in Washington, DC. Alpha waves oscillate from 8 to 12 Hz, and are typically present while awake. 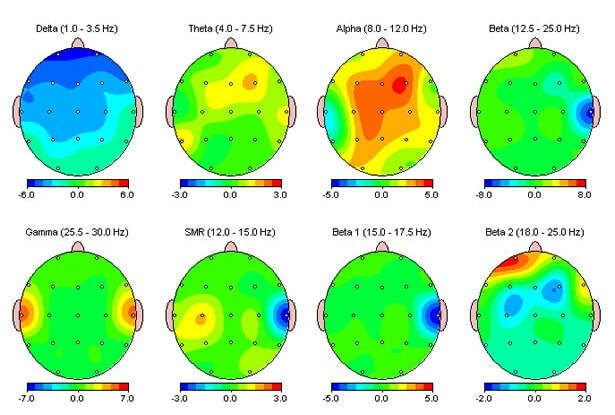 Alpha brainwaves are associated with relaxed attentiveness while awake, and can be measured to assess the potential for a patient to increase their cognitive flexibility. When there is more high frequency alpha (10 to 12 Hz) relative to the amount of low frequency alpha (8 to 10 Hz), an individual is likely to exhibit higher intelligence and faster mental processing than if the ratio were reversed. When alpha presents as pathological, it can interfere with sleep patterns through a process known as “Alpha Wave Intrusion” in which the brain requires delta brainwave patterns during sleep, but alpha is produced in its place. This has been linked with chronic pain disorders such as fibromyalgia, which MDs who utilize neurofeedback Washington, DC may address (Germanowicz, Lumertz, Martinez, & Margarites, 2006). The Sensory Motor Rhythm (SMR) brainwaves oscillate between 13 and 15 Hz, a narrow range sometimes associated with high alpha and low beta activity. Healthy SMR is associated with bodily presence, relaxation, and attention. Unhealthy SMR activity is associated with depression, various forms of seizure, chronic pain, body tremors, and dystonia. Beta waves oscillate between 16 and 25 Hz and are associated with increases in mental work, especially when involving arithmetic problem solving. Beta can be unhealthy when the brain is unable to increase and decrease its production fluidly, as well as when the brain produces excessive beta, which is associated with emotional volatility, anxiety, and chronic fatigue. Beta immediately precedes the higher frequency brainwave patterns called gamma, which are measurable by neurofeedback providers in Washington, DC. Gamma brainwaves occur between the frequencies of 28 and 40 Hz. Healthy gamma is associated with focus, the integration of disparate brain regions, high mental processing speed, and cognitive engagement. Gamma is often targeted for improving cognitive and physical performance when memory or attention declines are present. Unhealthy gamma is associated with Obsessive Compulsive Disorder (OCD), poor memory, and a hyperactive cingulate gyrus. Children with autism often exhibit symptoms of unhealthy gamma, and so neurofeedback in Washington, DC may be used to attenuate an overactive cingulate gyrus. With a general understanding of brainwaves and their corresponding subjective mental states, there is enough information to begin exploring some detailed clinical reports regarding the use of neurofeedback in Washington, DC. Neurofeedback in Washington, DC is a form of biofeedback, which is used clinically to treat the neurological component of mental disorders. Biofeedback is a general term, which refers to the act of providing feedback to an organism regarding that organism’s own physiological states (such as heart rate, blood pressure, etc.). Biofeedback is designed to provide the user with information that represents a particular physiological state in such a manner as to provide more volitional control over those states. “EEG – biofeedback” refers to the detection of particular brainwave patterns by an electroencephalogram (EEG) and the communication of that activity to the organism in order to gain more control over particular brainwave states. Because mental disorders often have a neurological component, DC neurofeedback has been increasingly sought after for the treatment of psychological illness. Beginning in 1958, neurofeedback in Washington, DC has been increasingly used in the latter part of the 20th and the early 21st centuries as an effective clinical tool for the treatment of serious mental disorders. According to A Symphony in the Brain, modern neurofeedback in Washington, DC owes its clinical power to the pioneering work of the earliest experimenters of the 19th and 20th centuries (Robbins, 2008). Richard Caton, in the 1870s, was the first English physician to record brainwaves by attaching the electrodes of a reflecting galvanometer to the exposed brains of rabbits and monkeys. His primitive tool was able to detect variations in the electrical current of exposed brain tissue and was eventually able to measure signals through the skull. In 1924, Hans Berger, a German psychologist, was the first scientist to ever record brainwave frequencies through the scalp of a living human. After conducting a number experiments with electrically sensitive nodes attached to the inside of the skull on patients who were missing bone, he acquired the technology which would enable him to publish On the Electroencephalogram of Man, in which 10 Hz was labeled the “Berger rhythm”. He later discovered a number of other frequencies and was the first to observe electrical brain death in a dying dog. His research was largely an end of its own until Joe Kamiya conducted the first ever neurofeedback experiment in America (Robbins, 2008). In 1958, Joe Kamiya, a psychologist at the University of Chicago, conducted the first neurofeedback experiment in which a subject was able to manipulate his own brainwaves. Kamiya’s pilot study used a single-subject repeated measures design in which the subject, Richard Bach, was given instruction to report whether or not he was experiencing a dominant alpha brainwave state when he heard an audible tone. Kamiya observed Bach’s brainwave patterns as they were represented to him on an EEG in a separate room, and he told Bach whether or not he was correct in his assessment. The first trial was conducted in a single day and consisted of 60 tones followed by 60 guesses (yes or no, this is an alpha state). The results of the trial indicated that Bach could not distinguish between an alpha brainwave state and any other state better than chance. By the second day, he had reached a 65% accuracy rate, by the third day he could assess whether or not he was producing alpha 85% of the time, and by the fourth day his recognition was still growing. The second part of the study no longer asked Bach to merely recognize his brainwave state but to control it (Robbins, 2000). By the time Bach had reached the second part of the study, he was proficient at recognizing his own brainwave states and was ready to begin producing alpha at will. Bach was instructed to enter into an alpha brainwave state when he heard a bell ring once and to exit the state when he heard a bell ring twice. His prior familiarization with the alpha state apparently prepared him to demonstrate competence at entering and exiting the state with ease. When asked how he was able to produce alpha, he reported that an absence of visual images reflected his subjective experience of the state, “When I imagine music from an orchestra, I’m in alpha but when I imagine a visual image of the orchestra it seems to cause an absence of alpha.” Kamiya’s experiments were eventually published in Psychology Today in 1968 and brought forth the field of neurofeedback in Washington, DC (Robbins, 2008). By the 1970s, neurofeedback in Washington, DC had become a clinical tool used for treating emotional and neurological disorders. Margaret Ayers founded the first neurofeedback clinic, and in 1978, began treating closed head injuries, seizures, ADD, and depression. By teaching patients how to control their brainwaves, she believed, they could reduce their symptoms in a manner that medication could not. By this time, it had been discovered that brainwaves lie on a spectrum from low to high frequencies categorized as delta, theta, alpha, beta, and gamma. These Greek letters were eventually subdivided into more nuanced versions of high, low, and mid-frequency brainwaves as the technology was refined and more anecdotal reports were collected. When the technology in the field of complementary medicine began to proliferate, organized bodies of professionals were established in order to regulate the burgeoning industry (Larsen, 2006). Although there are dozens of variations of software applications as well as hardware manufacturers for neurofeedback equipment in Washington, DC, there are currently two main categories of neurofeedback in Washington, DC. Traditional neurofeedback is subdivided into the monopolar and bipolar coherence training approaches, while stimulation-driven neurofeedback (SDN) is primarily dominated by the Roshi and low-energy neurofeedback system (LENS) approaches. These two approaches represent the major types of clinical neurofeedback technology ("Neurorehabilitation & neuropsychological," 2010). Neurofeedback in Washington, DC follows the general principle that desirable brainwaves are rewarded and undesirable ones are inhibited. Neurofeedback in the District functions first by detecting the frequency with which electrical signals are being discharged in the brain through the use of electrodes attached to the scalp of a user and connected to an EEG device. A computer then interprets the electrical information and digitally provides either positive or negative feedback to the user, indicating his or her brainwaves as beneficial or pathological. The user may be provided with a visual or auditory feedback element, such as an image or a tone, which indicates whether the patient is producing brainwave patterns indicative of health or sickness. By consistently receiving feedback regarding which brainwave patterns they are producing, patients learn what it feels like to produce those frequencies, and they eventually learn how to freely move from one state to the other. Professionals who use neurofeedback as a clinical tool, focus on either monopolar or bipolar coherence training for their patients ("Neurorehabilitation & neuropsychological," 2010). Monopolar and bipolar coherence training are two forms of neurofeedback in Washington, DC that use different treatment strategies. The monopolar treatment strategy employs the use of a single electrode attached to one of 19 clinically significant locations on the scalp, and two electrodes on neutral sites that emit no brainwaves (such as the earlobes). The monopolar technique enables the user to increase or inhibit brainwave patterns at one targeted brain region at a time. The bipolar coherence training strategy uses the same 19 clinical sites but instead makes use of two electrodes placed in a number of possible combinations with one electrode attached to a neutral site. The purpose behind using two electrodes is to enable the patient to develop the capacity to synchronize disparate brain regions in order to achieve greater neurological coherence. While monopolar and bipolar neurofeedback techniques are powerful tools for developing control over brainwave states, the SDN techniques are purported to have improved upon this technology through the addition of brainwave entrainment. Brainwave entrainment describes the brain’s tendency to follow a rhythmic stimulus and to reproduce that stimulus internally as brainwave patterns (Larsen, S., 2006). The usage of Audio-Visual Stimulation (AVS) has been employed since the 1970s in order to induce altered states of consciousness through the use of flashing light goggles and rhythmic audio harmonics. By simultaneously pulsing Light Emitting Diodes (LEDs) in the eyes and an audio harmonic in the ears at a rate of 10 Hz, the brain of the recipient will begin to generate a 10-Hz-dominant brainwave frequency. This technology has been considered to be effective at modulating brainwave frequencies in order to achieve altered states of consciousness, which increase the release of mood-elevating chemicals. Brainwave entrainment was then adopted by the neurofeedback community in Washington, DC, which combined the technologies into SDN. The Roshi is an SDN technique that does not require that the patient learn how to control his or her brainwaves but allows the brain to regulate itself through the use of entrainment (Oleson, 2004). Instead of using a fixed-form brainwave entrainment protocol, as most AVS equipment does, the Roshi system is dynamic. Roshi operates by detecting brainwave patterns and are then fed into an AVS device worn by the patient. The AVS output is actively shifted in tandem with the brainwave states of the patient, giving the patient a veritable dose of his or her own brain. It is posited that when the brain receives an AVS input of its own activity, that activity is disentrained and therefore made easier to “drive” to a target frequency. Because there is no volition involved in the Roshi, it is thought to be helpful for the patient to experience the automatic unfolding of change, more so then with traditional systems that require learning and volition. The Roshi is currently using the older technology that the LENS eventually abandoned in exchange for another version of SDN. LENS is a form of neurofeedback in Washington, DC, which utilizes very low frequency radio waves in order to drive brainwave patterns into a target range of frequency (Larsen, 2006). The LENS technique operates under the supposition that by merely disrupting brainwave patterns, which are causing electrical incoherence in the brain, the brain will naturally reorganize itself. Because the dysregulated brain produces patches of electrical activity that act as electrical snags, LENS aims at releasing those snags in order to allow the brain to bring itself into a regulated state. By interpreting the brainwave states of various regions of the brain, the LENS software recognizes when a region is producing abnormal electrical activity, and in response, emits a 15- to 100-mHz signal at an intensity of 10 to 18 watts/sq. cm. Through interrupting these electrical snags, the brain then automatically reorganizes its electrical activity to a more coherent and well-regulated system (Larsen, 2006). In order to better understand the clinical application of neurofeedback technologies, it is important to a have a basic understanding of brainwave states and their correlated subjective states of awareness. Dr. Les Fehmi of the Princeton Biofeedback Centre was a post-doctorate graduate fellow at the UCLA Brain Research Institute, and he has devoted the majority of his professional career to the development of Open-Focus states of consciousness in the human mind (Fehmi & Robbins, 2007). These states are primarily concerned with sustained attention that encompasses all aspects of experience equally and which is correlated with enhanced alpha brainwave amplitude and coherence at select sites. Fehmi trains his clients to develop control over their mental attention with neurofeedback in Washington, DC and guided visualization exercises that are each designed to evoke high amplitude coherent alpha brainwave activity. These exercises are primarily focused upon developing an awareness of physical “space”, where he may ask an individual to “imagine the space in between your eyes”, “between your ears”, “inside your skull”, “inside your chest”, “inside your arms and legs”, etc. Fehmi has observed that placing attention upon space causes attention to move from “narrow-focus” to “Open-Focus”, where thoughts, feelings, and sensations may more easily flow through awareness, which enables depressive, anxious, and stressful feelings, and physically painful sensations to simply dissolve once awareness is intentionally brought into those regions of the body where such sensations are present. The Open-Focus state is likewise associated with increased alpha power and coherence. This is similar to “Focusing”, which is a somatic awareness discipline in which an individual is instructed to place his or her attention on a disturbing thought, feeling, and accompanying somatic sensation, which results in the transformation of that disturbance into something more positive. Eugene Gendlin of the Focusing Institute studied psychotherapy for 15 years beginning at the University of Chicago and eventually determined that a client’s subtle awareness of interior state changes was the single-most important factor that contributed to breakthrough and transformation in psychotherapy. ​Neurofeedback in DC also suggests that you learn about a Canadian neurofeedback training center located in British Columbia is currently applying a revolutionary approach to psychospiritual transformation through the use of alpha brainwave training in order to enhance awareness and promote forgiveness (Hardt, 2007). The Biocybernaut Institute is led by Dr. James Hardt, who founded the organization and has shaped its philosophy and training practices since 1983. Hardt has focused upon the importance of training coherent alpha brainwave patterns in those who wish to participate in the program, because enhancing alpha patterns in the brains of human beings may result in spontaneous forgiveness and consequently, enhanced emotional well-being, focus, and cognition. Attaching electrodes to the scalp of a participant who enters the training room enables a computer to detect the level of coherent alpha-wave activity in the brain, which is correlated with an interior state of consciousness that may be experienced by the trainee directly. Through auditory feedback that is produced by the computer, participants may receive a clear indication of their successful activation of coherent alpha-wave activity and monitor their errors. Trainees also have access to a visually represented numerical score of their alpha performance, which gradually increases as they learn to respond to the auditory feedback and adjust their techniques. Each trainee may develop an entirely unique approach to enhancing alpha feedback, but the state is generally enhanced by relaxation of the body and the release of conceptual thought. The key to the success of the Biocybernaut process may very well be the early observations of a Zen master and his 30 students. Hardt measured the electrical activity in the brains of these experienced meditators at the Langley Porter Neuropsychiatric Institute at the University of California at San Fransisco in order to chart coherence measures and EEG amplitude, which eventually resulted in a detailed power and spectral analysis. Later, Hardt's conversations with Dr. Arnold Mandel resulted in a sudden realization that such coherence patterns were also correlated with the appearance of a torus pattern over the head of the advanced meditators, which was later depicted as a halo by their disciples. Due to the traditional significance of halos and their association with realized spiritual masters, this further drew Hardt into the investigation of applied neuroscience and its capacity to promote enlightened states in those who undergo Biocybernaut training; the process has been a success. According to Hardt, "Thirty minutes of that feedback was enough to rocket me into the Peace That Passeth All Understanding so that I was feeling . . . outrageously happy for months thereafter" (Hardt, 2007). During his field research, Hardt also discovered that many of the Biocybernaut participants were experiencing tremendous difficulty with producing alpha-wave activity when they encountered formerly repressed psychological material, but their scores increased significantly upon exercising forgiveness. This discovery has led to a general orientation toward rigorous forgiveness training and active release work that promotes the production of target alpha. The presence of forgiveness proved critical to the release of emotional trauma that may have accumulated through years of painful interactions with one’s environment due to personal, familial, cultural, or other forms of conflict, and it is one of the critical skills trainees must acquire in order to successfully walk the path to a joyful and abundant life. Therefore, the institute promotes the practice of "Extreme Forgiveness" as described in Hardt's The Art of Smart Thinking. ​ Once the process of awakening through forgiveness begins to unfold, the trainee's direct link to their Higher Self (Jung would simply refer to this as the “Self”) becomes of preeminent importance. The Higher Self naturally emerges during these states of high alpha coherence, and it guides the transformational process that results in ongoing ego dissolution/death. However, working through painful memories and defense mechanisms that may otherwise prevent the emergence of a higher spiritual reality is of great importance. Therefore, the Biocybernaut Institute provides extensive human support that includes highly empathic coaches who work closely with trainees in order to facilitate psychological transformation and direct linking with the trainee's higher self. Hardt refers to these trainers as "assistant coaches" to the Higher Self, which serves as the "head coach”; this is as an opportunity to abandon the practice of submitting to a spiritual leader in favor of promoting the autonomy of the individual. The Biocybernaut Institute is a pioneering organization that has worked at the leading edge of applied consciousness and neuroscientific research for the past three decades. As our civilization identifies solutions to human problems, these developments may represent the next stage in the human race's social and spiritual evolution. Erik Hoffman, PhD, is Research Director at Spindler Mental Fitness and Research Centre at Symbion-Science-Park and researcher at Copenhagen. Hoffman has developed new neurofeedback methodologies, which may be utilized in Washington, DC. These neurofeedback methodologies focus upon gamma-range amplitude training that is primarily concerned with activating the left-parietal pre-frontal cortex’s gamma wave amplitude in the 40-Hz range (Hoffman, 2012). Hoffman hypothesizes that the traditional yogic philosophy on “Kundalini awakening” produces an experience of profound mental clarity, focus, and increases in intelligence through shifting brain function from the parietal cortex into the prefrontal cortex. Although his research has not undergone major double-blind clinical control trials, he has conducted interesting preliminary pilot studies that demonstrate a correlation between the subjective report of activating Kundalini through a traditional yogic practice called Deeksha and the enhancement of gamma wave activity in the prefrontal cortex. He took his hypothesis one step further and began conducting gamma neurofeedback on the same site in which he observed increased gamma activity during the yoga practice. This was accompanied by the client’s subjective report that she had entered into the same state as with the original practice. The client reported that the feedback signal may have actually enhanced the clarity and consistency of her state shift and so posited that gamma-range neurofeedback on this site may be beneficial for developing her spiritual practice (Kundalini awakening). Hoffman reports that this region of cortex is responsible for the experience of will power, focus and attention, and the experience of oneness. If you are located in Washington, DC, you may ask your neurofeedback provider to experiment with these protocols. Hoffman’s research is inspired by Andrew Newberg’s SPECT-scan studies that report increased blood-flow to the left-parietal prefrontal cortex while advanced Tibetan meditators are deeply engaged with their practices. Newberg’s theory is that when focus is shifted to a single point (God, Guru, or breath), the Attention Association Area (AAA) of the brain is activated, and the Orientation Association Area (OAA) (relationship to physical space and time) is deactivated. The activation of the AAA is hypothesized to shift awareness away from the OAA, which results in a loss of a sense of boundaries (experience that all things are one) and time (experience of timelessness). This may be one potential explanation for why deeply engaged meditators experience “nowness” and “oneness” during their practices, where a permanent shift in brain function may be correlated with a sustained ability to experience this state, which may be a form of classical enlightenment. Richard Davidson has likewise conducted research on advanced Tibetan meditators at the University of Wisconsin, Madison. Davidson is most well-known for his research partnership with the Dalai Lama, where eight of the Lama’s most advanced meditators (40-years of meditation for 12-hours each day) were found to exhibit extremely high levels of gamma-wave activity in the left region of the pre-frontal cortex, which has since been associated with feelings of love, joy, and compassion. Hoffman’s clinic also focuses upon providing alpha neurofeedback (Learn more about Washington, DC options) for deep meditation and gamma training for mental “sharpness and determination, deep peace combined with intense alertness, clear and sharp imagery when needed, [and] intuition and high performance” (Hoffman, 2012). Dr. Stephen Porges of the Brain-Body Center at the University of Chicago was the first person to measure heart rate variability (HRV), and he developed the Polyvagal Theory, which has been focused upon the 10th cranial nerve, the vagus (Porges, 2011). HRV represents the length of time that elapses between heart beats and the degree to which these spaces in time are variable within an optimum range defined by physiological studies on the optimal HRV (Shaffer et al., 2014). Very subtle changes in HRV have been purported to correlate with immediate moment-to-moment changes in cognitive and emotional state. Here, good HRV/good vagal tone has been correlated with positive emotional states (love, compassion, social bonding, gratitude, freedom, etc. ), and poor HRV/poor vagal tone has been correlated with negative emotional states (anger, anxiety, depression, etc.). The premise of Porges’s theory has rested upon the observation that the human nervous system is comprised of a phylogenetic hierarchy of more recent evolutionary brain structures (i.e. prefrontal cortex) and more primitive/ancient brain structures (i.e. the brainstem) (Porges, 2011). The dorsal vagal complex (DVC) is a region of unmyelinated nerve fiber that stimulates the immobilization response, which is a standard reptilian or amphibian response to stress. Meanwhile, the ventral vagal complex (VVC) is a region of myelinated nerve fiber that is linked with mammalian adaptations to an increasingly complex environment, which is linked with social behavior. Porges refers to this region of tissue as the “smart vagus”, because it responds to social stimulus and regulates the fight and flight responses when a threat is perceived. The activity of these vagal systems may be measured through observing the HRV, and adjustments in breathing pattern and attention may, in turn, adjust activity within these systems. Compare with Neurofeedback in Washington, DC. Specifically, the VVC may be stimulated through slow exhalations, such as with a long sigh or a slow and steady out-breath (vagal breaking triggers a parasympathetic/relaxation response). Conversely, the VVC may be de-activated through inhalation and quick exhalation, each of which allows the heart rate to rise (vagal breaking is disabled, which allows sympathetic/activation response). This may suggest that the VVC (smart vagus) serves as a common mechanism that is triggered through extended vocalizations, such as those used in the Catholic Gregorian traditions, where long exhalations are designed to promote a sense of safety, connection, love, and mental clarity in order to cultivate prayer or meditative states (vocalizations include Ahhh, Ohhh, Eeee, Oooo, etc.). Moreover, the VVC is also activated through detecting visual and auditory cues from other mammals. For example, the VVC may be activated through observing another mammalian face that is smiling softly with gently resting eye-lids. Here, the affective regulation of the sending mammal’s facial expression is mediated through the sender’s “smart vagus”, which triggers a response in the receiver’s “smart vagus”, and a sense of mutual relaxation is achieved. Similarly, the auditory perception of another mammal’s release of a slow exhalation, or a soft and slow vocalization, may trigger a relaxation response due to the socially attuned nature of this nerve and its integration with the nerves of the inner ear. The HeartMath Institute strongly advocates for regarding the heart as a central organ that is responsible for physiological and psychological health and well-being. The institute has explained that the heart is the first organ to form in utero, and this is followed by the brain-stem, amygdala, thalamus, and cortex (Chile & Martin, 2000). The heart includes 40,000 neurons, which is comparable to other discrete cortical sites within the brain. The heart is the principle location for the psychosomatic experience of love, compassion, gratitude, and other positive feelings. The heart is also the area to which individuals point when referring to themselves or “I”, so subjective experience and subsequent identity formation may be strongly linked to the neural hub of the heart. Meanwhile, Dr. J. Andrew Armour of Dalhousie University in Halifax, Canada, was one of the first pioneers on neurocardiology. He demonstrated that a localized nervous system within the heart may be sufficiently sophisticated to constitute a small brain (Chidre & Martin, 2000). Here, sensory neuritis and local circuit neurons detect and process information from the exterior environment, which may then be transmitted to the brain (note: the heart also continues to beat after the connection to the brain is severed, which indicates that the heart may self-regulate its beats rather than being subordinate to the brain). Armour has demonstrated that the several varieties of neuron, neurotransmitter, protein, and support cells imbued the heart with the capacity to learn, remember, feel, and perceive, while detecting hormonal levels, heart-rate, and pressure information. Moreover, each heartbeat relays an electrical signal to the brain via the vagus nerve and medulla in order to submit information that may ultimately influence or direct behavior, depending upon the circumstance. Neuronal impulses from the heart may directly impact neurological activity in both lower and higher cortical regions of the brain, where it may impact complex cognition. This information may provide evidence for the proposition that the heart’s activity may directly influence emotions and interact with conscious thought. This strengthens the case for HRV biofeedback as a core component of any neurofeedback program in Washington, DC that strives to enhance CNS and brain health. The heart was formally reclassified as a part of the hormonal system in 1982 when researchers discovered that a powerful hormone named atrial natriuretic factor (ANF) or atrial peptide was secreted by the atria of the heart (Napier et al., 1984). This hormone is responsible for regulating blood pressure, body-fluid retention, and electrolyte balance. This hormone exerts effects upon the kidneys, adrenal glands, and various regulatory systems in the brain. Further research has demonstrated that ANF inhibits the release of stress hormones, may interact with other hormonal systems that influence the growth and operation of reproductive organs, and may interact with the immune system. The heart has also been demonstrated to produce noradrenaline and dopamine, but the effects of these chemicals have not yet been determined. Neurofeedback in Washington, DC, however, is highly effective. Therefore, the heart may be regarded as a vital organ that is responsible for both the circulation of blood and regulation of CNS activity, as well as a hormone regulator. The heart also produces an electromagnetic field with each pump (Burleson & Schwartz, 2005). This electromagnetic (EM) field is reportedly the most powerful in the body and approximately 5,000 times the strength of the field produced by the human brain (Chile & Martin, 2000). HeartMath has reported that experiments conducted by Gary Schwartz and colleagues at the University of Arizona have demonstrated that “complex patterns of cardiac activity in our brain waves could not be fully explained by neurological or other established communication pathways”. As a result, their data has been interpreted by some to suggest that presence of an electromagnetic (EM) interaction between the heart’s EM field and the brain’s EM field. Once more, this suggests that training HRV may be critical for supporting general CNS and brain health, particularly if the EM fields of each organ are either unidirectional or bidirectionally interactive. The HeartMath Institute also emphasizes the importance of re-training the nervous system in order to ensure that stress is reduced and coherent HRV is elevated (Childre & Martin, 2000). The key principle of this orientation is underscored by research conducted by Psychologist Janice Kiecolt-Glaser and Immunologist Ronald Glaser of The Ohio State University, with married couples. Their research on the effects of mental and physiological stress on the human biological system—where frustration, aggression, and other behaviors that express hostility to another person—are linked with elevated heart-rate, suppressed immune response, and increases in stress hormones that inhibit neurological development. Individuals who are chronically stressed will tax their energy reserves by consistently returning to a high-energy consumption state. Here, the “fight or flight” response is associated with adrenaline release, where blood vessels constrict in order to move blood away from the brain and other vital organs and then into the muscles in preparation for surviving a dangerous event. These basic stress responses are deeply linked with a “fear of death” response, where the prefrontal cortex (responsible for complex reasoning and focused attention) is temporarily deactivated, and the amygdala becomes hyperactive, thereby producing an experience of fear. These stress responses are designed specifically for responding to life-threatening situations but are often repeatedly initiated throughout an individual’s daily life as he or she experiences challenges that are non-life-threatening. As a result, energy resources are directed away from creative, restorative, and healthful psychological and physiological activities, and provided for expenditure on stress responses that are unnecessary and produce no value to the biological system. Survival becomes the body’s goal, which causes the system to utilize a tremendous amount of physiological energy on ensuring that this goal is achieved. However, there was no real threat to warrant the consumption of these resources, which results in energy depletion with little value added to the body system. Therefore, training for a high HRV may be an effective means by which to achieve heightened energy efficiency within the human body system. This page is designed for individuals who are interested in learning more about Neurofeedback in the Washington, DC area. Those who live in NE, NW, or SE, SW DC or the surrounding areas of Maryland and Virginia may be interested in contacting DC Neurofeedback to learn more about the variety of services, which are available in the area. Neurofeedback has been available in the District for many years, and there are multiple solutions for a variety of client needs. For executives who are interested in DC neurofeedback, we provided integrated training solutions in order for individuals and groups to enhance their personal and professional development. For parents who would like to promote their children's personal growth and development for enhancing executive attention during academic studies, DC neurofeedback may provide a solution, because EEG/neurofeedback training is designed to promote the brainwave patterns that are correlated with enhanced alertness, relaxation, and self-regulation capabilities. For individuals who are interested in personal development or spiritual exploration, DC neurofeedback systems are also capable of training the brainwave states associated with deep and introspective awareness. Neurofeedback providers are abundant in the Washington, DC area, but there is only one fully integrated solution for the vast majority of needs that are present in such a large population. Business executives may be interested in enhancing their capacity to remain relaxed and alert for sustained periods of time without causing Central Nervous System dysregulation - Neurofeedback in DC provides this solution through training executives to enhance Alpha and Theta production in order to recuperate psychological resources while simultaneously enhancing Gamma and Beta brainwaves in order to enhance alertness and perspective integration. There are some who will say: You are promising too much through offering these Neurofeedback services in the Washington, DC area. This is the reason why we have provided clear disclaimers to ensure that prospective Neurofeedback clients recognize that we do not intend to diagnose or treat disease. Neurofeedback in Washington, DC is designed for general wellness purposes and as a component of a healthy lifestyle rather than a substitute for medical treatment. Moreover, our Neurofeedback services are designed to ensure that you learn how to train your brainwave patterns, Heart Rate Variability, and much more, in order to enhance psychological strength and resilience. DC neurofeedback provides individuals with the opportunity to learn how to self-regulate their brainwave patterns through attaching electrodes to the scalp, which measures EEG signals (Electroencephalograhy signals). These are the subtle electrical fields that are produced when neurons discharge during standard brain operations. Neurofeedback provides individuals with the capacity to observe and monitor their brainwaves, self-regulate their brainwaves, and enhance their capacity to do so both with and without the DC neurofeedback services. Therefore, one may experience a preliminary learning curve, where they are heavily reliant upon the DC neurofeedback services in order to evoke an interior state change. However, through progressively training at our neurofeedback clinic, users may develop the capacity to evoke these state changes independently, at home, and without the equipment. For those who are interested in taking equipment home, we also provide neurofeedback/biofeedbakc solutions, which may be brought with them for deeper and more comprehensive at-home training. 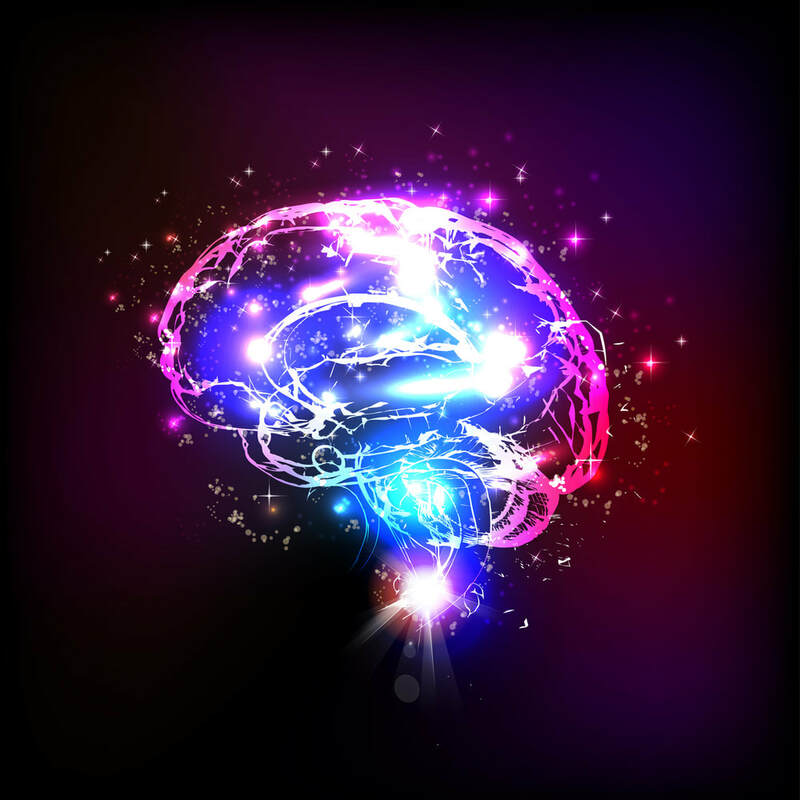 This is only provided to individuals who have demonstrated a strong interest in neurofeedback services in DC, because taking equipment home is a high cost and high quality method for enhancing training results. Therefore, only those who are prepared to invest their personal time and resources into expanding their neurofeedback training capabilities from in-clinic to out-clinic training will be considered for our at-home training program, which includes regular follow-up from our team. Through completing and integrated Washington DC neurofeedback training protocol 1-on-1 with our training team, you will develop the capability of securing a personalized, at home biofeedback training system. DC Neurofeedback services are not limited to those who live in the Washington, DC metro area. There are many other locations, which we serve, but the nation's Capital serves as a primary place in which we may integrate with the broader national interests. The objective of our organization is to bring more neurofeedback training and services to the DC Metro area, because we would like to integrate with the most influential organizations around the world. To provide executives with best in class neurofeedback training in DC, we must ensure that we share our information with those who live, work, and visit the Washington, DC area. This includes Adams Morgan, Dupont Circle, Georgetown, the White House / Capital Building complex, and many other locations within the District. The objective of our DC neurofeedback services are to ensure that individuals and groups are capable of accessing the most sophisticated neuro-training solutions in the U.S. and beyond, because this serves to enhance personal growth and development for the benefit of all beings. Through developing self-regulation capabilities through DC neurofeedback, executives and leaders around the world may enhance their capacity for diplomacy, peace-making, and constructive world development. This, of course, would appear to be a great challenge, because how, if at all, does DC neurofeedback ensure that individuals continue to grow and develop their peace-making and diplomatic capabilities? The answer is simple: Through developing the capacity to self-regulate brainwave patterns through DC neurofeedback, executives and leaders may learn how to promote more peaceful, positive, and loving brainwave states, which are correlated with enhanced executive attention, empathy, and other cortical features associated with diplomacy and peacemaking. Therefore, the objective of our organization is not to simply provide neuro-training for the purpose of personal entertainment - Rather, the objective is to deliver highly targeted neurofeedback brainwave training to any and all leaders who visit the Washington, DC metro area in order to conduct business. The objective in establishing a harmony of brainwaves within one's personal body ensures that leaders are capable of extending their personal state of self-awareness, care, compassion, and well-being, to many others around the world. Through ensuring the executives and leaders complete a neurofeedback training intensive in DC, we work to ensure that these individuals bring to bear a positive capacity for self-regulation, warmth, love, and care to the organizations that they serve. This, of course, is not limited to the feelings of love and compassion that are evoked DC neurofeedback training provides Gamma training for the left parietal prefrontal cortex (recently discovered to be associated with love and compassion. Rather, this extends to include the capacity to evoke these states of enhanced psychological clarity during challenging diplomatic meetings, where one may easily take offense and lead one's nation into war, sanctions, or other damaging policies. Through ensuring that executives and leaders complete a neurofeedback training intensive in the Washington, DC area, we work to ensure that leaders are capable of self-regulating their physiological and psychological state for the benefit of their constituents - Whether local, national, or international. Therefore, we strongly recommend that any and all rising diplomats complete a neurofeedback training intensive in DC in order to enhance psychological resilience, empathic capabilities, and stable executive attention. These neurofeedback training intensives in DC are not simply for those who are interested in learning more about the brain - They are designed for individuals who recognize the value of personal growth and development as a means by which to extend love, compassion, and service to the world.